OPSEU Information picket outside the Niagara CCAC offices March 19th. When the unhappy staff at the Niagara branch of CarePartners first entertained the idea of organizing themselves into a union, CarePartners owner Linda Knight picked up the phone and called each of the workers. She promised that things would get better if only the front line home care workers gave her another chance before joining a union. Nobody knows any of the financial details of Knight’s business – the for-profit CarePartners is not publicly traded and is therefore not required to report the details of its operations. Nor are for-profit companies working with public money required to post on the Sunshine list. We do know that in 2003 Profit magazine ranked Knight 33rd among the top 100 women business owners based on the firm’s gross revenues. Media reports suggest CarePartners had more than 500 nurses on the payroll – a huge leap forward from the kitchen-table nursing operation Knight started in 1984. The fact that a prominent CEO and business owner would call about 100 workers pleading with them not to organize was extraordinary. The gambit worked at the time, and the workers gave her another chance to make things better. Knight never honoured that pledge. Fool me once, but not twice. 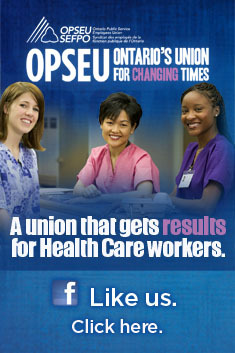 About a year and a half ago the nurses and administrative staff did organize with OPSEU. By this point Knight had joined forces with Red Cross to create Red Cross Care Partners (RCCP). Despite the involvement of the not-for-profit Red Cross, the combined organization maintained its for-profit status and all details of its operations remained secret, even if it utilized public money. 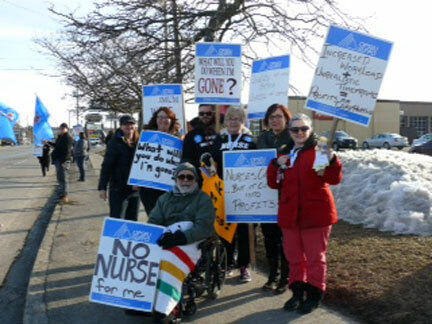 By December 2013 about 4,500 personal support workers were set to strike over many of the same issues the Niagara nurses and administrative staff now face. Red Cross Care Partners hired Bass and Associates to negotiate for them, resulting in one of the largest home care strikes in Ontario history. That strike was only resolved on Christmas Eve after both parties agreed to binding arbitration. Twenty months after organizing, the Niagara workers are facing Bass and Associates again at the bargaining table. This time the employer is only Linda Knight, who purchased the company back from Red Cross. It still remains for-profit and secretive about its affairs. Linda Knight is nowhere to be seen or heard from in Niagara. She is not calling the staff this time to promise anything. For 20 months CarePartners has dragged its feet, preferring to argue over the definition of a casual employee rather than establish a respectful relationship with the mostly women who earn Knight her profits. For a first agreement there were too few bargaining sessions and too much push back from the employer on items that are absolutely standard in the sector. It looked to the frustrated workers like they would never get a deal. Many simply decided to leave and work elsewhere. It’s a tough time to be in home care. Ontario stopped the wasteful competitive bidding process that was driving wages down and workers out of the sector. However, any increases in provincial funding have gone towards additional volumes, not to address other cost pressures, including wages. Recently the expert panel the Ontario Health Minister convened to make recommendations around home and community care specifically noted the need to close the gap in wages across the province and between health sectors. It called for a human resources plan to address shortages of professional and support workers in home and community care. It also underlined the need for accountability that appears to be sorely lacking. That difference in wages and benefits is definitely being felt by workers at CarePartners Niagara office. This is an employer that expects professionals to care for very ill patients, yet doesn’t even make any provision for sick pay. Linda Knight appears content to let Bass and Associates play hardball at the table. We know what happened in 2013 and the disruption it created for Ontario’s home care recipients. With an April 10 strike date looming CarePartners has suddenly shown some interest in bargaining. These workers are motivated to walk a picket line. Some are upset that the deadline was extended to facilitate additional bargaining dates, especially with a 94 per cent strike vote. Linda Knight is playing with fire. She can instruct Bass and Associates to get a deal done, or she can be subject to a second strike in just over a year. With the province looking at shaking up the home care system, she needs to pay close attention. An agency that can’t deliver on its contracts is not likely to win favoured status back at Queen’s Park. This entry was posted in Uncategorized and tagged CarePartners, Hamilton Niagara Haldimand Brant CCAC, Linda Knight. Bookmark the permalink. Please don’t forget Claude Tremblay (CEO of Red Cross) came in to each and every office and basically threatened reprisal if a Union was voted in………….. a very important piece in this timeline. supporting you in our prayers! Community Healrh Care. Look close and you will see it on the horizon . again…the same obfuscation..again..more smoke and mirrors…it necessitates government intervention and the sooner the better..we have already lost too many conscientious non profits ..